Ramadan has been confirmed as starting on Wednesday (the rights and wrongs of virtually the whole world starting on Wednesday is a whole other subject) inshallah – Ramadan Kareem. Inshallah we will be able to make the most of this blessed month, by our actions, our fasts, our prayers and our duas. Inshallah these will all be accepted. The weather in the UK is getting rather hot surprisingly meaning that we have gone from a fairly cold June to proper full on heat in July. On one hand this is great but with fasting in mind I know I am going to find it really tough. While not fasting all I am thinking about is cool drinks. A variant on the watermelon ginger drink is 50:50 watermelon and strawberries in a blender, sieved and topped again with chilled sparkling water. Something that I have become quite fond of over the past couple of years is Gazpacho – a chilled soup from Spain. If you think about it as cold soup there is a mental barrier to climb. However it is much more like a drinkable salad. 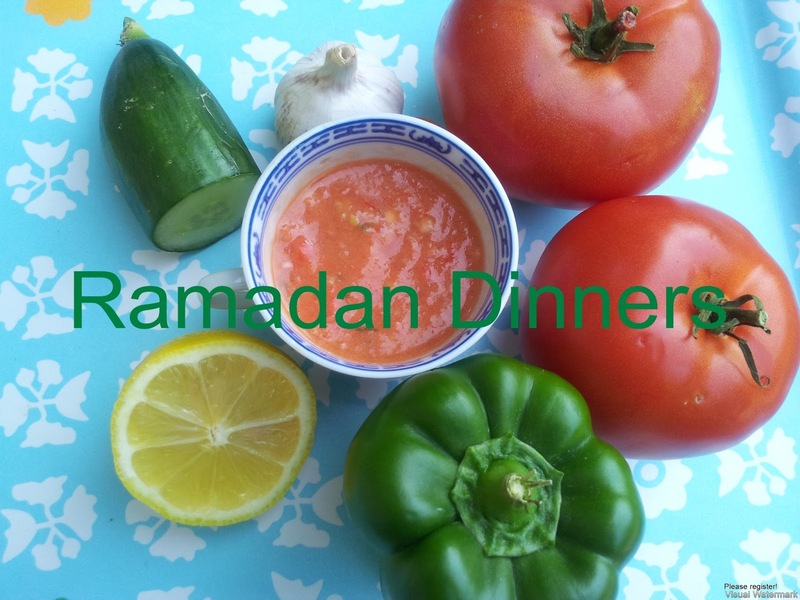 I think this would fit in really well for iftari, particularly for the time between opening the fast and before pra ying magrib particularly if you follow the: open fast – have something to munch on – pray magrib – eat iftari way of doing things. This is filling as it contains water containing vegetables so it rehydrates which is very important at this time of the year. It is also gentle on the stomach. Importantly, it means that your body has something to process before you start eating properly. As with many recipes, there are many ways to make this. I choose not to add bread in mine as a) I am gluten free and b)I don’t feel as the bread adds anything to the dish. Don’t add onions and spice to this as this will make it less of a drink and more of a spicy dip. You should be able to taste the olive oil and the vegetables. 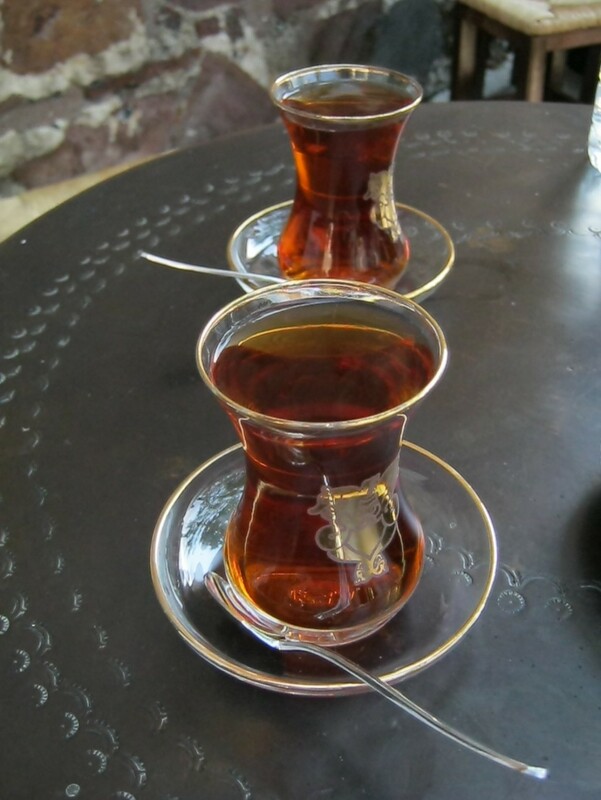 I, for one, will be looking forward to a cool glass of this tomorrow evening inshallah! All whizzed up in a food processor. I like to leave mine so that there are small bits to chew on rather than a fine puré. Keep this chilled in the fridge before serving. Resist the temptation to add ice cubes as this will just water down the taste. I serve mine in shot/small glasses with a teaspoon or when we have more people I place into jugs so that people can help themselves. Enjoy !! Once again Ramadan Kareem, inshallah our duas will be answered. While fasting this month remember to remember those in our duas who we don’t know and will probably never meet but they are like us, muslims, fasting in extraordinary circumstances throughout the world uncertain as to what the evening will bring. May Allah (swt) ease their pain, give them stability, give them food, give them water, give them safety, give their children a secure future ameen. Finally please remember the orphans or children without families in your duas…their needs are far more greater than ours…ameen. I’m not exactly sure why, but last night I decided to cook a few things rather than just one or main plus carbohydrate. 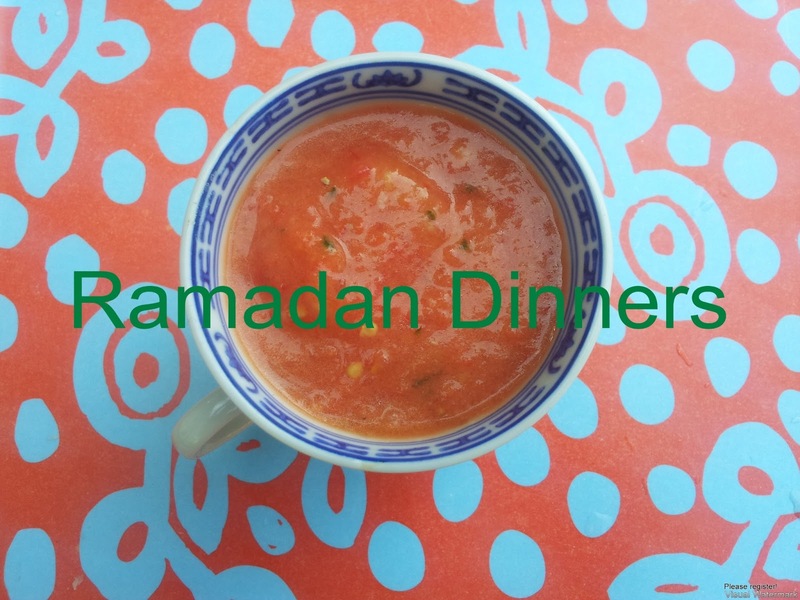 We’ve still been working our way through various countries but some iftaris weren’t really worth blogging about eg the night we had England as our theme, we had fish shop fish and chips…well the gluten eaters did. I had supermarket gluten free fish fingers with chips and baked beans. The following night with the US as our theme it had to be burgers. Last night we hit Spain. * Cup = any mug you have just make sure to use the same for both the measures. 1. Wash the rice and set aside in some water. 3. Put enough olive oil to cover the base of the pan, then fry the onions on a low heat until they are golden. 4. When the onions are done add the lamb shoulder, browning the meat. 5. Add 4 cloves of chopped garlic to the lamb and continue to brown. 6. Add the salt and paprika, stir and coat the lamb with them. 7. Finely chop the tomatoes then add to the pan. 8. Now add enough water to cover the meat entirely, bring to boil and then leave to simmer on a low heat for 20 minutes with a lid on. The water should have reduced slightly but there should be enough covering the meat. 9. Wash the butter beans until the water runs clear then add the beans to the pan. Stir to adjust the placement of the meat and beans in the pan. 10. Finally add the drained rice to the pan. Level out the rice so that it is evenly distributed in the pan. Do not stir the rice at all. 11. Heat the pan till the liquid till it boils, then reduce and leave to simmer for 15-20 minutes with the lid on. 12. Switch the heat off, and place the green beans and red pepper on top of the rice. Place the lid back on to the pan and leave standing for 10 minutes. Do not open until the 10 minutes are up. Cube the potatoes into approximately ½ inch cubes, put in a pan of water and boil for approximately 5 minutes. Drain and place on an ovenproof tray and spray with spray oil and place in the oven at 200 degrees for an hour and a half or until golden brown. 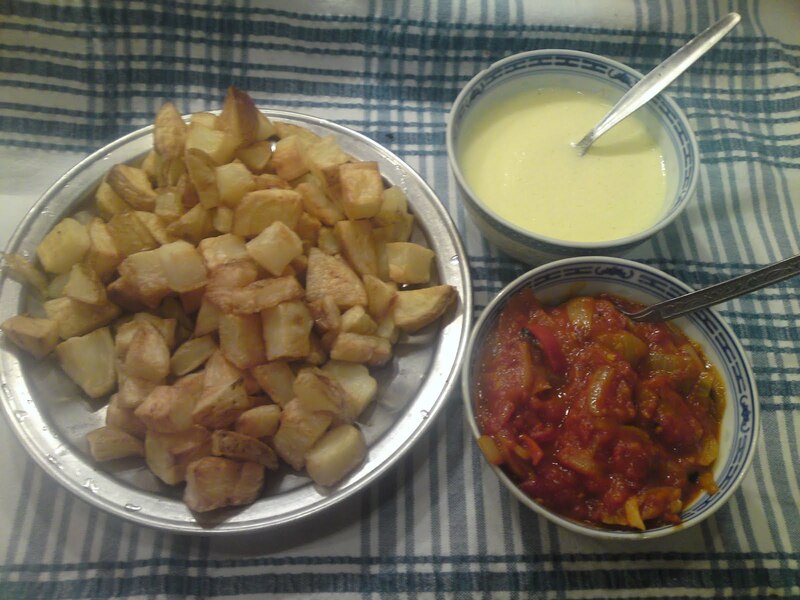 Serve hot with the bravas sauce and allioli. Slice the onion and fry in the olive oil until golden, add the chilli, tomatoes, salt and smoked chipotle. Gently stir on a medium heat until the sauce is thick. Combine the egg, garlic, teaspoon of vinegar, teaspoon of olive oil in a food processor and blitz until they take on an emulsified consistency. Gradually pour in a little olive oil until you reach a thin mayonnaise consistency. I find doing this bit slowly helps. Put approximately 1cm of olive oil in a pan with the crushed garlic and heat on a very low heat for approximately 5 minutes. Increase the heat to medium and then add the chilli, prawns, mussels and the water. 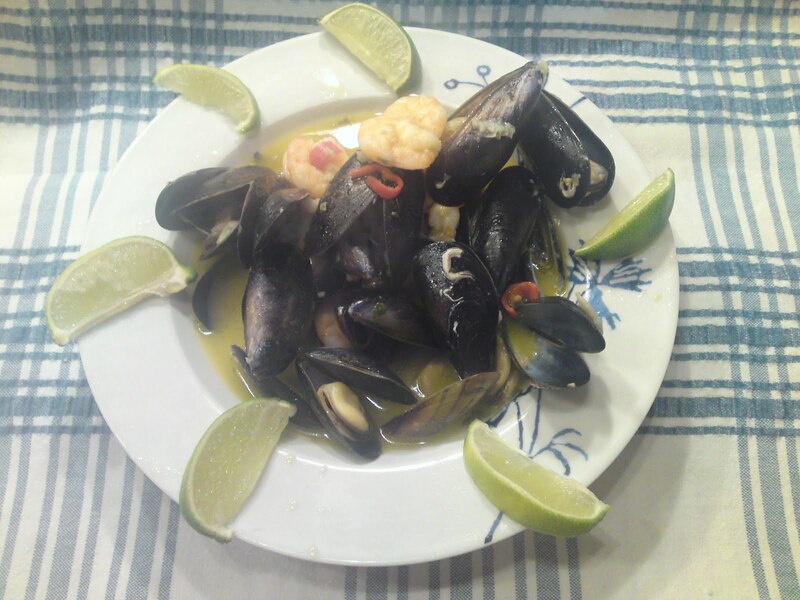 Place a lid on the pan and cook for 7 minutes or until the prawns and mussels are cooked all the way through. Serve with sliced limes. Slice tomatoes, goats cheese. 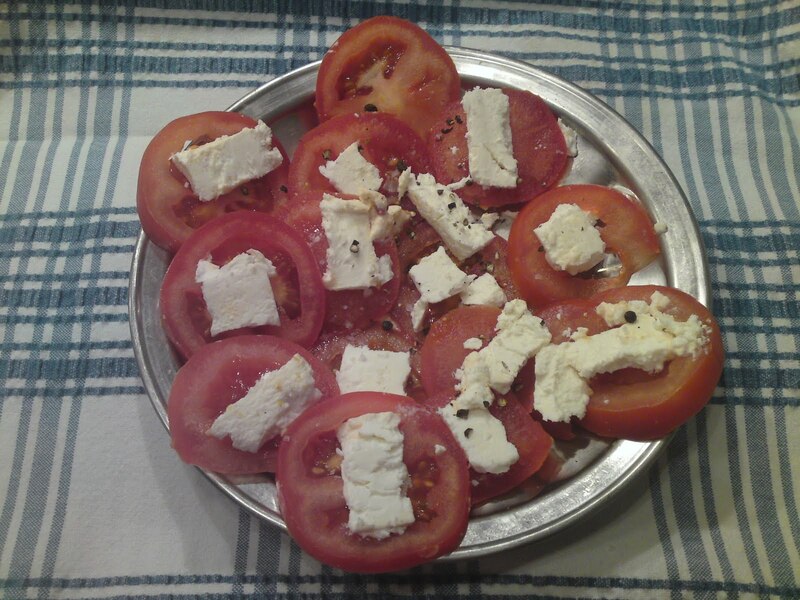 Arrange the goats cheese on the tomatoes and sprinkle cracked black pepper and coarse sea salt on top. Before this evening if you had asked me what I thought about Paella I would tell you the first word that would spring to my mind was grit! Yes, honestly, grit! I think back to the first time I ate Paella and this was the first texture that hit my mouth followed by my taste buds being assaulted by salt. Not one to repeat mistakes it wasn’t until recently that I ate Paella again that I liked it. You may think what is there not to like in rice, but honestly grit can have that kind of an effect on a person. Paella apparently has muslim origins. Back in the days when the Arab Moors had the Caliphate of Cordoba (approximately year 1000) following the banquets of the rich the servants would be given “Baqiyah” (leftovers in Arabic) and this would then be mixed with what ever meat, fish and vegetables were to hand. Modern Spanish legend of the origins of Paella are entirely different naming the banks of lake Albufera near Valencia where fishermen caught fish, fried snails, a few legumes and rice grown on the edges of the lake, omitting any Moorish involvement. Either way this is now a dish in its own right. This recipe is lovely, no grit in sight! 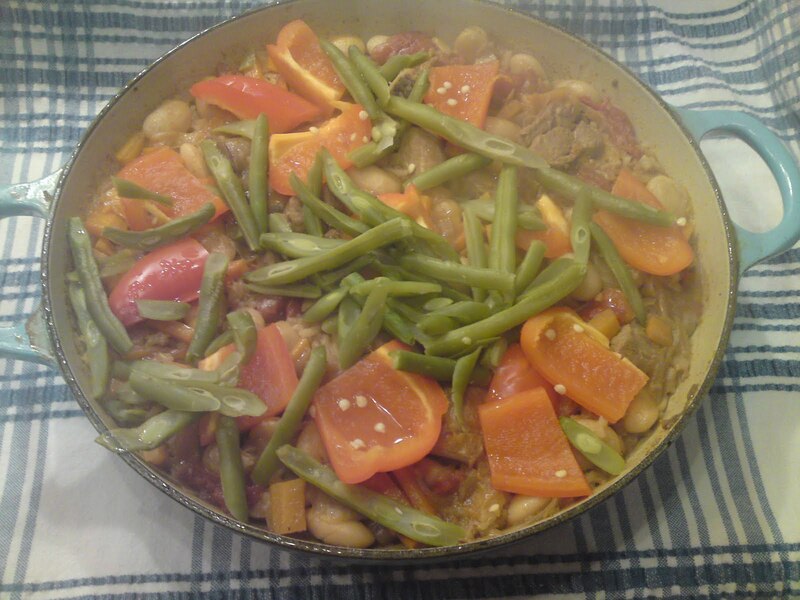 The lamb is soft and sweet, the beans filling and the sugar snap peas vibrant. The taste is both garlic-y and nutty. 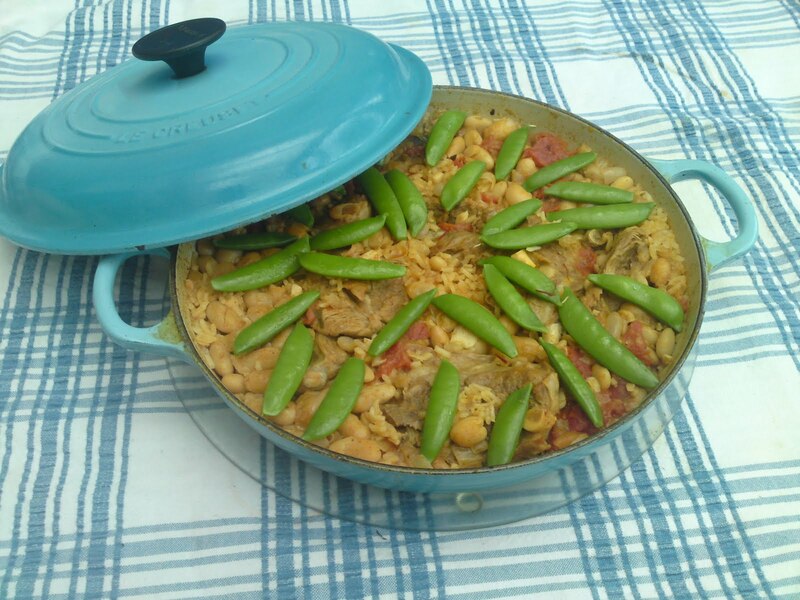 Paella is normally cooked in a large flat paella pan like a large frying pan however because I wanted to speed up the process and wanted the lamb to be tender I used a Le Creuset shallow casserole pan with a lid. Finally a note regarding the paprika, I’ve used 3 teaspoons of paprika as I felt it did not give enough taste to the dish and this may well be because the paprika was not very strong. I would none the less suggest starting with 2 teaspoons and increasing if you need more. 4. When the onions are done add the lamb chops and spare ribs, browning the meat. 8. Now add enough water to cover the meat entirely, bring to boil and then leave to simmer on a low heat for 20 minutes with a lid on. The water should have reduced slightly but there should be enough covering the meat. Taste the liquid to see if more paprika is needed. 9. Wash the beans until the water runs clear then add the beans to the pan. Stir to adjust the placement of the meat and beans in the pan. 12. Switch the heat off, and place the sugar snap peas on top of the rice. Place the lid back on to the pan and leave standing for 10 minutes. Do not open until the 10 minutes are up.